Light-watchers living and fire at the south point seen from the north. SCHOKLAND-the Lighthouse is back on the northern tip of schokland, in the shadow of the former Lighthouse home and to the port of Old-Emmeloord. 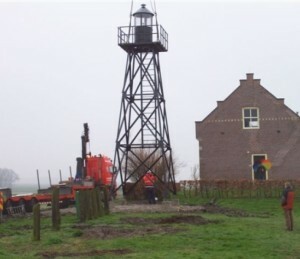 The return of the this lighthouse was part of the Flevolandschap Rescue project. In that context the old cemetery on the northern tip has also been restored. The objective is to make Schoklands history tangible again. 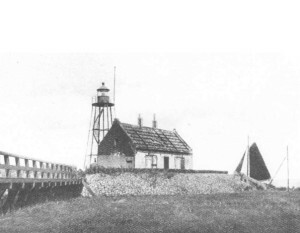 The lighthouse is a symbol of the uprising Zuiderzee Past Schokland. The lighthouse on the northern tip must be build about 1915. So more than fifty years after the evacuation of the island. A lighthouse keeper was still there and the harbour of Emmeloord was a refuge for ships during storms on the the Zuiderzee. It happened at a time when more and more ships opted for the west route. Which admittedly was more dangerous during storms, but because the ships became heavier and had great depth the shallow route on the east side of the island was not without danger. The light insurgency disappeared when Schokland merged into the North-east. The fog horn lost its function, but the building is still there. Based on Archives and footage, it was possible to make an almost authentic replica. The third and final project on the northern tip of Schokland was placing a splash guard around the Light Guard House, as it was in the passed. The Flevolandschap has finalized the project during a public festival. 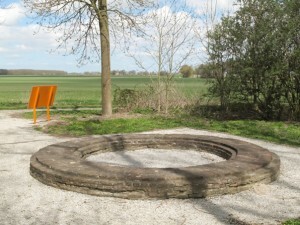 So the Flevolandschap has taken new steps making a piece of schokland-history visible for the public. The Lighthouse is back on the northern tip. In 1995, the schokland lighthouse was added to the UNESCO World Heritage list. On 30 June 2007 at Schokland the agreement of Schokland has been presented. Thanks to the Flevolandschap for making this activation possible. The ruin original base of the lighthouse.